If you are facing money and wealth related problems in life, then as per Hindu astrology Shivratri is the ideal time to propitiate Lord Kuber – the treasurer of Devas – the guardian of all money and wealth on earth. Below is the mantra to chant on Shivratri. 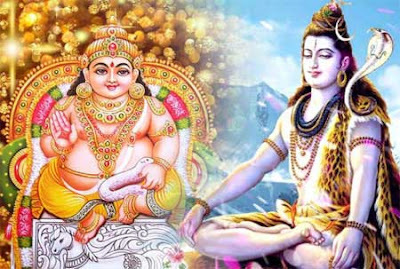 How to Chant Kuber Shiva Mantra on Shivratri? Do the puja when there is Chaturdashi Tithi during Pradosh period on Shivratri. Chaturdashi is the fourteenth day during the waxing or waning phase of moon. Perform the puja before a white shivling – if it is not available then you can imagine the Shivling in mind and do puja. Offer white color sweet. After puja give this to a cow. Keep a piece of gold, silver and iron near the lamp or Shivling. Chant the above given mantra 108 times. Keep count on a Rudraksha mala. After chanting the mantra, take a red color cloth and put the pieces of silver, iron and gold in it. Tie it tightly and keep it in your shop, business establishment or in locker where you daily keep money in home.